Chandigarh 21st September:- Did you ever wish you could see the future. Would you like to know if there are any surprises coming your way today. Do you want to save yourself from getting into trouble for that prank you played on your classmate? Well, of course you do! But maybe you are not as lucky as Nysha Kapoor, the lead protagonist in the soon-to-be launched show, Palak pe Jhalak on your favourite Disney Channel. 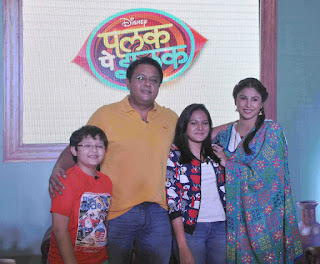 Palak Pe Jhalak will be an extension of Disney Channel's promise of entertaining and giving uplifting moments to families through heart-warming stories like these. Nysha's story will reflect the slice of life of an average Indian family, with twist of her getting 'bhavisyavaani'. To promote the serial the starcast of the "Palak pe Jhalak" visited the city beautiful Chandigarh. Nysha, asimple, young, bubbly tween, lives in New Delhi with her parents, Kunal and Nita and her little brother Rohan, except that she is not just any ordinary girl. Nysha has an extraordinary gift, because of which, she can see flashes of the future. But poor Nysha, most of the times misunderstands her vision, or as she calls it 'bhavishyavaani'. This leads to the beginning of her adventures which lands her into trouble. Always bailing her out of trouble are her two best friends, Ishaan and Tara, who at times may also increase her problems, although without intending to do so. Ayesha Kaduskar, who plays the role of Nysha Kapoor said that Nysha is an ordinary tween with extraordinary powers. Her unique gift of seeing the future in flashes lands her into trouble most of the times. She can completely relate to Nysha as just like her, she loves dressing up and chilling with her friends. She is very close to her family as she is and hence all of this made it very easy for her to portray the role of Nysha Kapoor. Her uniqueness of being able to see flashes of the future is extremely exciting and she is sure that it would make every girl want to be like her. She had enjoyed being a part of all her adventures and I am sure you all will too. Palak pe Jhalak is an Indian adaptation of Disney Channel's hit TV show, that's so raven. The show has been conceptualized and re-created keeping in mind the Indian family sensibilities, however keeps intact the elements of humour, friendship, and loyalty from the original show. In order to provide quality entertainment that celebrates togetherness and heart-warming moments with Indian families, the show is one of the many, to be launched in the near future under Disney's proposition of 'Shanivaar, Ravivaar, only for Parivaar'. Prepare to be enthralled once again as your favourite Disney channel is ready to take you on another roller coaster ride of expression, celebration, belief and dreams starting this Sunday, 27th September at 10:30 am only on Disney Channel. on sunday when it is ten thirty then doroemon comes.